Released by Nintendo, the Wii is a home video gaming console that is quite popular among the gaming enthusiasts. 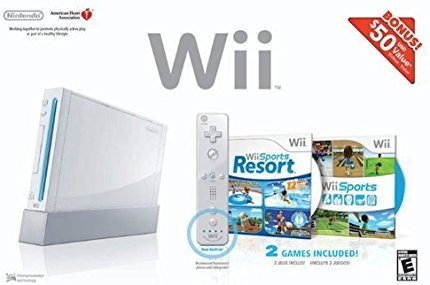 The console comes with some amazing features and functions like Wii Remote controller, WiiConnect24, and others which make it better than other brand consoles available in the market. In addition to playing games, you can also use Wii to watching your favorite DVDs. The console does not support playing the disc directly, but there are other ways round for the same. So for the question on does the Wii play DVDs, the answer is yes, but not directly. Read below to get the best solutions on how to play DVD on Wii. Can you play DVDs on a Wii? Though the official site of the device says “No” to this question, but using The Homebrew channel you can play your disc on this glowing blue drive. This method is designed by the team of Wii coders which provides the option to the users for unlocking Wii and playing their DVDs. Using this solution, you need to download the homebrew video player which is also known as Wii unlocker, copy the file to the SD card and then use the Channel to apply the 2-second patch. Once the patch is up ad runs, you need to open the Wii Mplayer app from the Homebrew channel, insert the disc and let Wii play DVD. Though the method of Homebrew Channel seems to be simple, certain requirements needs to be fulfilled before proceeding with the actual steps. An SD card reader/writer (alternatively, you can also use a USB device which works as one). For this method to work, there are 2 main steps- installation of the Homebrew Channel, and installing the DVD player. Step 1 Install the Homebrew Channel. 1. Insert the SD card into the slot of the reader and copy the “private” directory of the Twilight Hack on your card. Here you also need to copy the Homebrew Channel “boot.dol” file. 2. Next, insert the SD card in the Wii and then delete the saved Zelda file on Wii File Manager. If you do not have the game already, you can start a new one. 3. There comes 2 versions of the Zelda- RVL-RZDE-0A-0" or "RVL-RZDE-0A-2. Though both these versions work, but you need to check and apply the correct hack. For example, RVL-RZDE-0A-0 works with TwilightHack0 while RVL-RZDE-0A-2 is compatible with TwilightHack2, both are available in the package. 4. Next, move to the file manager and then switch the SD view. Now copy the correct version of the hack. 5. Finally insert the game disk of Zelda, start the game, and then save it. After the Homebrew Channel installer starts, you can enjoy playing your DVDs. 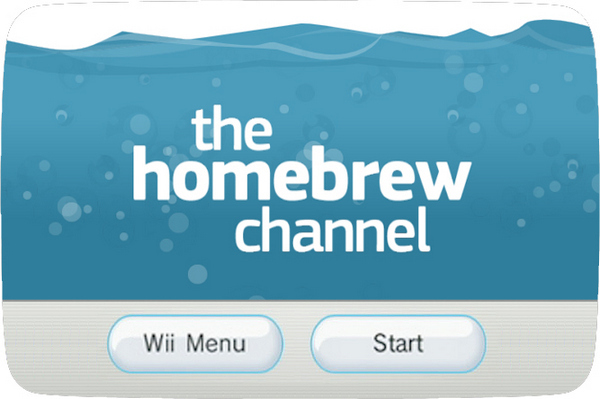 After the process is complete, you can access the Homebrew channel like any other Wii program. Step 2 Install DVD Playback program. 1. Once HBC is successfully installed you now need the installation of a third party DVD player which will allow you to play your discs on Wii consoles. 2. On your SD card, find a space which is safe and where you can install and copy the third party DVD player app. 3. Insert the SD card in your console and start HBC. You will have access to the 2 programs which are present on your SD card. Next, run the DVDX installer app. Select the “Normal installation” as it ensures smooth running of the program without any issues. Step 3 Play DVD on Wii. 1. Go to HBC and select MPlayer. 2.Select DVD-Video and then choose the Title. 3. Finally, play your desired DVD. Though the Homebrew Channel converts your gaming console into Nintendo Wii DVD player, there are risks and limitations involved. First of all, the MPlayer app has a lot of bugs and issues due to which you may not be able to play all the movies. Above all, if anything goes wrong with this method, it will result in bricking of the console. Can Wii play DVDs without any limitations or risk? The answer to your query is “Yes”. Using good and professional software allows you to convert your DVD discs into Wii compatible format which can be played on the console without any risk to brick your Wii. Wondershare UniConverter (originally Wondershare Video Converter Ultimate) is one such excellent program that facilitates converting your DVD videos to Wii compatible format which can be then copied to the console for playback. The Wondershare program supports more than 1000 formats for converting your files to desired video or audio format. Device specific conversion is also supported for all popular models including Wii, PS3, PS4, Xbox One, Xbox 360, and others. Using this method is not only safe and secure but also ensures lossless quality conversion at a fast speed. The software works on Windows as well as Mac system and also support editing videos with its built-in video editor. Step 1 Launch Wondershare Wii u DVD player and load DVD files. 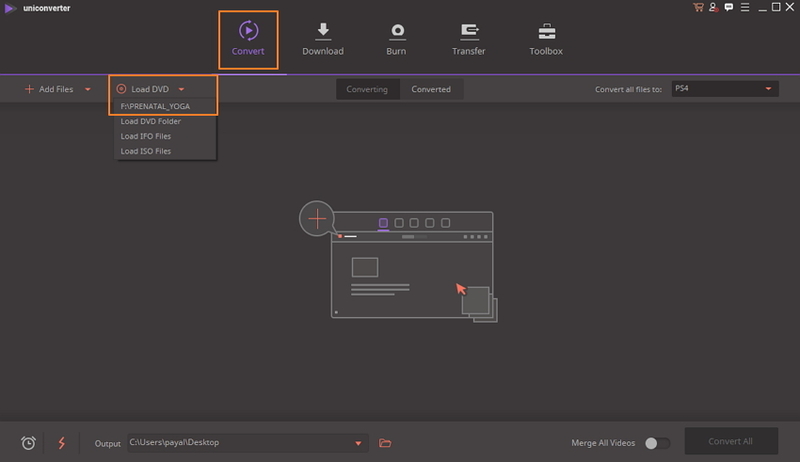 Download, install and launch the UniConverter (originally Wondershare Video Converter Ultimate) program on your PC/Mac. Insert the desired DVD into your PC. From the main program interface, select drop-down icon at Load DVD option from the Convert tab. Select the title of the inserted DVD. A new pop-up window will open from where you need to choose if you wish to add all the movies of the DVD or the main ones only. Step 2 Choose Wii compatible format. After DVD files are loaded to the interface, open drop-down menu next to Convert all files to: option. A new window will open from where you need to select Device > Games > Wii. Step 3 Convert DVD to Wii compatible files. At the Output option, select the destination folder on the PC where you want to save the converted file. Click Convert All to start the file conversion process. Once the conversion process is complete, copy the file to your SD card, and insert the same into your Wii console and enjoy the videos. So for the queries on can the Wii u play DVDs safely without any risk of damaging the gaming console, the answer is yes, when Wondershare UniConverter (originally Wondershare Video Converter Ultimate) is there. There are a number of models for Wii with different types of equipments, controllers, and games available. You can purchase the console as well as bundled accessories from Amazon as it has the widest options. To help you making choice, we have selected the best selling Wii Game Consoles for the year. 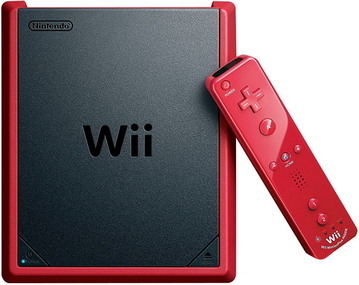 This is a limited edition Red Wii Mini Console- Mario Kart Bundle. The pack comes with a gaming console, a Wii Remote Plus controller, Sensor Bar, Power adapter, composite cables, and Nunchuk controller. 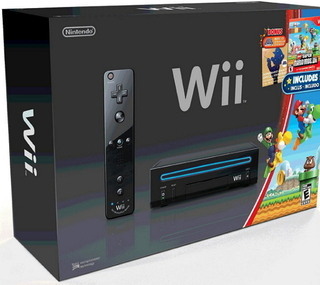 The model is compatible playing more than 1300 Wii games and has the Mario Kart Video game included. This is a blue Wii console that comes along with blue colored Wii remote. The device measures 15 X 5 X 10 inches in size and has weight of around 13 pounds. The model support a number of games which you can enjoy playing with your buddies. 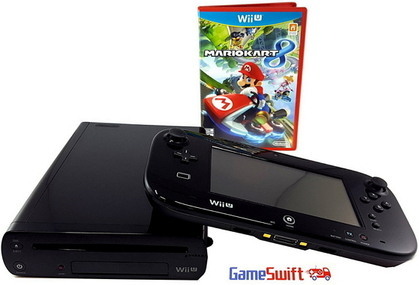 The model comes in black colored Wii U gaming console that has 32GB of internal storage. Measuring 14 X 5.5 X 11.8 inches in size, the device weights around 9.1 pounds. The Wii U lets you enjoy the whole new gaming experience and comes with GamePad controller. The console controller as well as the GamePad controller can connect wireless to the console as well as TV sets. This Wii gaming Deluxe Set comes in package including Wii U hardware with 32GB internal storage, GamePad, Sensor Bar, GamePad stylus, Adapter for console and GamePad, GamePad stand, HDMI cable, Console Stand, and Wii U GamePad Cradle. 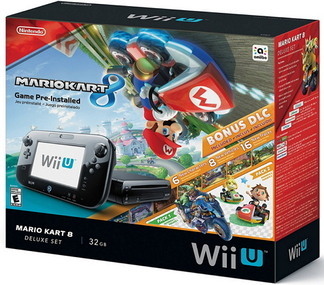 The console comes pre-installed with Mario Kart 8 so that you do not have to install any physical disc. It also includes a Nintendo eShop download card that is valid for 2 packs of bonus DLC. Additional includes 6 new characters, 16 new tracks and 8 new vehicles. With this Super Mario 3D World Deluxe Set, you get a gaming console with 32GB memory, GamePad, adapters for console and GamePad, stands for console and GamePad, HDMI cable, and pre-installed Super Mario 3D World Game and Nintendo Land. The device comes in black color and also has GamePad Cradle. There is 6.2 inches of LCD touch screen with 16:9 aspect ratio and it features button controls and also comes with 2 analog sticks. 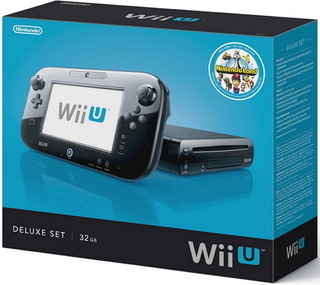 This is an exclusive limited edition of the device that comes with Wii U hardware having internal storage of 32GB. The Mario Kart 8 game comes pre-installed in the device. The Mario Kart 8 games has “E” ESRB rating and it comes with comic mischief. The kit comes along with gaming console, console AC Adapter, GamePad and its adapter, high speed HDMI cable, Sensor bar, GamePad cradle, and stand for console and GamePad. This is another popularly purchased model that comes with black colored Wii console , Wii Remote, Sensor Bar, AC Adapter, AV cable, Nintendo Nunchuk. The device allows you to connect up to 4 Wii Remote Plus controllers at a time using the Bluetooth powered built-in wireless technology. The motion control technology of the device makes it interestingly interactive. 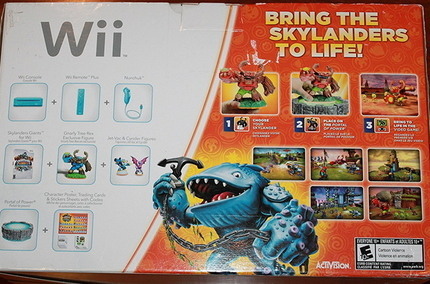 The Wii Controller also has a sensor that facilitates selecting menu preference, activate game and also scroll through the screens. This Nintendo Wii Gaming console comes in White color and offer excellent engaging experience. It comes along with Wii Remote Plus White, Wii Sports and Wii Sports Resort, and White Nunchuk. With the Wii Sports Resort, enjoy the improved intuitive controls and the unlimited fun. The Wii Motion Plus, offers deep controls for adding to your overall gaming experience. 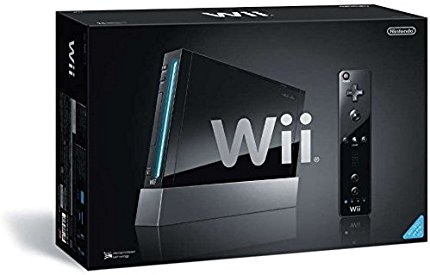 This Wii Bundle comes packed with a Black colored Wii gaming console, New Super Mario Bros Wii, Wii Remote Plus, Nunchuk, and Super Mario Galaxy 2 soundtrack. This model of the gaming console allows you to easily connect your device to internet with its built-in WiFi access. The Super Mario Bros. Wii allows 1 to 4 players to enjoy the game at a time . The game is available English, Spanish, and French language. The music for the game is created by a number of musicians to enhance your overall experience. 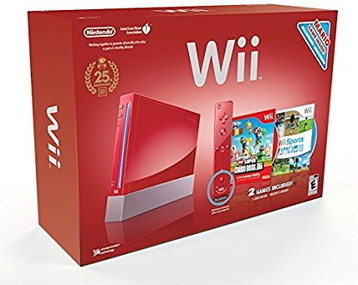 This Wii gaming console in red color is just perfect for the ones who wants something interesting not only in games but also in looks and colors. 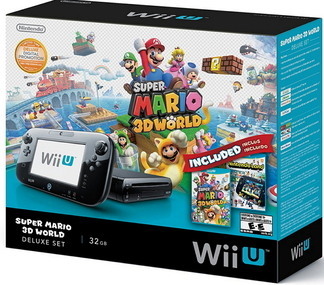 The model comes bundled along with Red Wii Remote Plus, Red Nunchuk, Wii Sports and the New Super Mario Bros. Wii game pack. This game wth rating of “E” enables 1-4 players to enjoy at a time and is available in Spanish, French, and English language. Thus it can be concluded that the best method to enable Wii u play DVD is by converting your disc files to a compatible format using Wondershare UniConverter (originally Wondershare Video Converter Ultimate). The solution is simple, easy, and has no risks involved.